We are regularly asked for quotations for replacement pumps. The customer usually has all of the existing data to provide us so that we are able to offer them exact replacement units. In this instance, the replacement required was for an Allweiler Pump. The customer only needed the replacement pump to fit onto their existing motor – so a bareshaft pump was offered. As this was an exact replacement, the old pump could be removed and the new pump installed without any pipework modifications at all. The pump required was from the NTT Allweiler pump range. 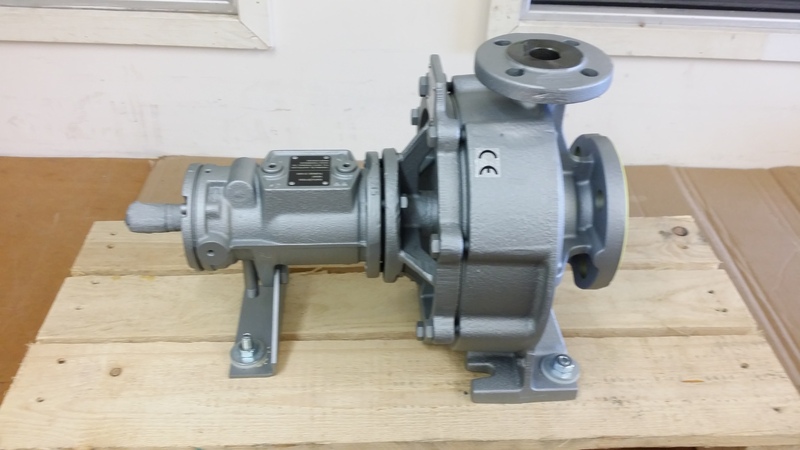 This pump is a centrifugal pump and is horizontally mounted with DN25 flanges on the inlet and DN40 flanges on the discharge with a 155mm impeller. The pump suits the existing motor running at 1450 rpm. The fluid being pumped was a synthetic heat transfer fluid. The pump has a maximum flow rate of 5.5m3/hr (91 LPM) with a delivery head of 6.5m. The design pressure of the pump is 13.3 bar at 250°C. Do you have an Allweiler pump requirement? Please do contact our sales team for assistance with your requirements by calling 01621 781144 – or UK freephone 0800 9 788844. If you have any questions, you can LiveChat with us during office hours too. We are here to help and look forward to hearing from you soon.